"1/1" redirects here. For January 1, see January 1. "Right Of Line.First Of Foot"
1st Battalion 1st Marines (1/1) is an infantry battalion in the United States Marine Corps based out of Camp Pendleton, California consisting of anywhere from 800 to 2,000 Marines and Sailors, but the number fluctuates depending on the Battalion's mission. They fall under the command of the 1st Marine Regiment and the 1st Marine Division. 1/1 is a battalion-level infantry unit composed of infantry Marines and support personnel. Company A (AAV company) - trained for insertion by Amphibious Assault Vehicles. Company C (Helicopter company) - trained for insertion by helicopter. Weapons company - usually split into 3 infantry platoons, each vehicle-borne through a variation of the Humvee. Mortar platoon - deploy and deliver 81 mm mortars via a M252 mortar system. Javelin platoon - employ the SMAW and, since its introduction in 2002, the Javelin weapons systems. CAAT platoon - includes heavy machine gunners (the 50-caliber machine gun or the Mk-19) and anti-armor missilemen (employ the TOW-2 missile). Since 2003, after the fall of Saddam Hussein's government, the strategic operations in the Middle East (Iraq, Afghanistan) have encompassed more than just a single objective. For Marine Corps units operating on a tactical level (relative to the Department of Defense) such as a battalion landing team, the actual execution of its traditional mission-oriented operations have adapted depending on the unit's objective (capturing high-value targets, providing stability and support operations, training local police and military units, and a three block war). Some of these operations have demanded reconfiguring the battalion's organization in order to conduct missions which are not included in traditional maneuver warfare (such as fire-team rushing, and anti-armor tactics). Military transition teams (MiT teams) have been used to provide assistance for the transition of power from the coalition forces to the local police and army in Iraq. While these MiT teams would draw personnel from other companies, Marines for other part of the division would often rotate into the battalion for a deployment in order to supplement the various companies' rosters. Rifle companies (A, B, and C) focused less on fire team rushing and more on variations of it within an urban environment (accounting for the 360 degree fields of fire of the enemy and the possibilities of improvised explosive devices). The mortar platoon of the Weapons company (usually resigned to the rear of the fighting line in linear warfare in order to set up and deliver indirect mortar projectiles) has experimented with various vehicle of mortarmen as riflemen. Weapons company utilized Mobile Assault Platoons  to provide quick reaction and mobility in urban missions. When trained as a battalion landing team, the battalion can attach to a Marine Expeditionary Unit and become the ground combat element. This designation gives the battalion a much broader role in its employment with the Navy, including non-combatant evacuation operations (NEO), humanitarian assistance operations (HAO), and ship-to-shore deployment (via air and sea). 1st Marine Battalion raising the United States flag at the Battle of Guantánamo Bay on June 10, 1898. 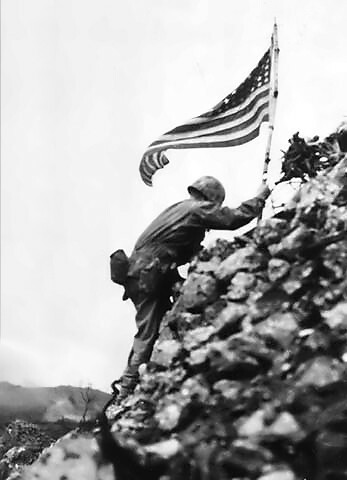 LtCol Richard P. Ross, commander of 1st Battalion, 1st Marines braves sniper fire to place the division's colors on a parapet of Shuri Castle on May 30, 1945. This flag was first raised over Cape Gloucester and then Peleliu. 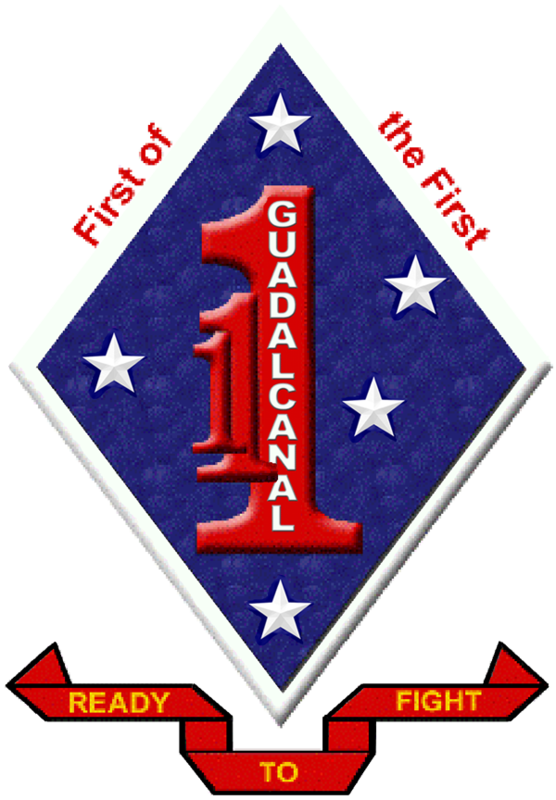 1st Battalion 1st Marines was activated on March 1, 1941 at Guantanamo Bay, Cuba. A month later they redeployed to Marine Corps Recruit Depot Parris Island, South Carolina but were quickly deactivated on June 18, 1941. Following the end of the war 1/1 returned to MCB Camp Pendleton in September 1945 and were deactivated on October 31, 1947. Following the outbreak of the Korean War, 1/1 was reactivated at MCB Camp Pendleton on August 9, 1950. Later that month they deployed to Kobe, Japan and from there took part in the amphibious landing during the Battle of Inchon. In October, the Marines were withdrawn from the Seoul area and moved to the east coast of Korea landing at Wosnan in late October. From there 1st Battalion 1st Marines participated in the Battle of Chosin Reservoir. They pushed as far north as Koto-ri, spending much of the battle defending their perimeter in this vicinity. The battalion spent much of the remainder of the war defending the thirty-eighth parallel. All told, it fought in the Korean War from September 1950 through July 1953. Following the war, the battalion participated in the defense of the Korean Demilitarized Zone from July 1953 to April 1955. 1/1 deployed to Da Nang, Republic of Vietnam in August 1965, under the command of LtCol Redford Sears, and were reassigned to the 3rd Marine Division. They remained in Vietnam until May 1971, serving in or around Da Nang, Dong Ha, Con Thien, Quang Tri, Huế, Phu Bai and Khe Sahn. They returned to Camp Pendleton, California in May 1971. They were again deactivated on May 28, 1974, but quickly reinstated on October 15, 1975. The 1st Battalion, 1st Marines deployed from Marine Corps Base Camp Pendleton in December 1990 to Saudi Arabia in part of a call to defend the Kingdom of Saudi Arabia from the Iraqi dictator Saddam Hussein in Operation Desert Shield. In the coming months, Regimental Combat Team 1 became Task Force Papa Bear, along with Companies Bravo and Charlie of the 3rd Assault Amphibian Battalion; 3rd Battalion, 9th Marines; 1st Tank Battalion; 1st Combat Engineer Battalion and 3rd Low Altitude Air Defense Battalion. After the start of Operation Desert Storm in February 1991, the Mechanized Battalion saw considerable combat as it crossed into Kuwait and fought a pitched armored battle at Al Burquan, and consolidated at Kuwait International Airport on February 27, 1991. After completing a search of a downed OV-10 reconnaissance aircraft on March 10, the battalion backloaded on April 24 to Camp Pendleton. On September 11, 2001, the Marines of 1/1 were deployed on a WestPac (a deployment in an Amphibious Ready Group (ARG) making rounds in the Western Pacific) as part of the 15th MEU. Specifically, they were in Darwin, Australia on port leave. The Marines were recalled early from leave, shipped out, and began preparing for the first major combat operations since the first Gulf War. The flotilla sped to the Persian Gulf and was the first MEU to land in Afghanistan. Later, the 26th MEU would join them and assist in Operation Enduring Freedom. Among 1/1's missions in Afghanistan was to assist in securing an airstrip outside of Kandahar, Afghanistan and establish Camp Rhino. The Marine battalion performed security operations around the area in support of the Northern Alliance's removal of the Taliban from power. The battalion also performed operations in Northern Pakistan. The Marines returned to the United States in early March 2002. Marines with the 15th Marine Expeditionary Unit (Special Operations Capable) during the early stages of Operation Enduring Freedom in 2001. The unit deployed in support of OIF I, assisted the local police and performed security operations in southern Iraq, mainly Um Qasar and Basra, co-located with British units there. After 2 weeks, the unit left the country, finished their West-PAC deployment and returned to Camp Pendleton. Later, as part of the 15th Marine Expeditionary Unit on the first Naval Expeditionary Strike Group-1 (ESG 1), they deployed in early 2005 to the western Pacific. During this deployment, they provided aid for the tsunami that hit Indonesia and Sri Lanka. After 3 weeks of assistance, the MEU headed for the Persian Gulf. There, they provided safety and security operations in Babil province south of Baghdad. Their forward operating base was Camp Falcon near Al-Mahmoudiyah and they spent 1 month there. The combat units performed continuous foot and vehicle patrols in the area, finding weapons caches and unearthing IEDs. One Marine was wounded in action during this deployment. 1/1 handed off the territory to 3rd Armored Cavalry Regiment (3ACR), which, after staying for many months, endured much less violence and conflict. A PBS documentary on the unit, Warriors, by Ed Robbins, documents this unit's deployment. The unit returned to Camp Pendleton in mid-2005 and prepared again to deploy in 6 months. They departed Camp Pendleton beginning on January 21, 2006. They were operating in Fallujah but in March, C Company began operations in the area around Abu Ghraib prison which is located about 20 miles (32 km) west of Baghdad. After two and a half months, Charlie Company returned to the Camp Fallujah area and the entire battalion was re-united in Karmah. C Company later moved to Saqlawiyah to replace 1st Battalion, 25th Marines. The battalion completed their deployment and returned to Camp Pendleton in mid-August 2006. 1/1 suffered 17 KIA'S on this deployment and more than 50 wounded. 1/1 deployed back to Al Anbar Province in mid-July 2007 to areas around Habbaniyah, Iraq. They were relieved by 2nd Battalion, 24th Marines on 6 February 2008. Nathaniel Fick - Wrote One Bullet Away: The Making of a Marine Officer, an autobiography about the Global War on Terror in Iraq and Afghanistan. 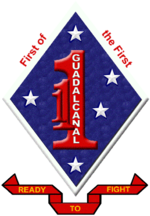 Wikimedia Commons has media related to 1st Battalion 1st Marines. ↑ Warfare. 1997. pp. 28–29. ↑ Martin Russ, The Last Parallel, p. 54. ↑ "Summary of Action for Operation Desert Storm 24–27 February 1991". United States Marine Corps Declassified Documents. http://www.gulflink.osd.mil/declassdocs/marines/19970107/970107_oct96_decls6_0002.html. Retrieved 13 December 2007. ↑ "History of the 15th MEU". 15th MEU. Archived from the original on 12 August 2007. http://web.archive.org/web/20070812005542/http://www.usmc.mil/15thmeu/PAGES/history_of_the_15th_meu.htm. Retrieved 15 July 2007. ↑ Public Affairs, Expeditionary Strike Group 1 (October 28, 2003). "13th MEU Provides Assistance in Southern Iraq". Navy Newsstand. Republished by GlobalSecurity.org. Story Number: NNS031028-13. http://www.globalsecurity.org/military/library/news/2003/10/mil-031028-nns01.htm. Retrieved 2007-12-26. ↑ ""What is it really like to be a soldier in Iraq?" in Warriors". America at a Crossroads. PBS. 2005. Archived from the original on 25 June 2007. http://web.archive.org/web/20070625042807/http://www.pbs.org/weta/crossroads/about/show_warriors.html. Retrieved 15 July 2007. ↑ Skelton, Cpl. William (1st Marine Division) (March 25, 2006). "Marines patrol Army territory near Abu Ghraib". Marine Corps Times. Story ID#: 20063291594. Archived from the original on 1 April 2006. http://web.archive.org/web/20060401194142/http://www.usmc.mil/marinelink/mcn2000.nsf/main5/FB4E013DEAA6DAF58525714000265DEF?opendocument. Retrieved 29 March 2006. ↑ Skelton, Cpl. William (1st Marine Division) (April 20, 2006). "Marines in Iraq thwart insurgency". Marine Corps Times. Story ID#: 200642661121. Archived from the original on 1 May 2006. http://web.archive.org/web/20060501035926/http://www.usmc.mil/marinelink/mcn2000.nsf/main5/2DDC83DA213A2BAE8525715C0037F89C?opendocument. Retrieved 26 April 2006. ↑ Skelton, Cpl. William (1st Marine Division) (May 5, 2006). "Marines, Iraqi police patrol Khandari". Marine Corps Times. Story ID#: 2006595250. Archived from the original on 9 May 2006. http://web.archive.org/web/20060509214852/http://www.usmc.mil/marinelink/mcn2000.nsf/main5/0892DC1051BE8014852571690033BA69?opendocument. Retrieved 10 May 2006. ↑ Murphy, Pfc. Jerry, 1st Marine Division (2008-02-06). "Marines from the Heartland storm into Iraq, relieving 1/1". Marine Corps News. Archived from the original on 15 August 2008. http://web.archive.org/web/20080815201059/http://www.marines.mil/units/marforpac/imef/1stmardiv/Pages/JAN0835.aspx. Retrieved 29 August 2008. (PDF) Warfare. Washington, D.C.: Headquarters Marine Corps, United States Marine Corps. June 20, 1997. Marine Corps Doctrinal Publication 1 (MCDP-1). http://www.dtic.mil/doctrine/jel/service_pubs/mcdp1.pdf. Retrieved 2007-12-25. "This publication, Marine Corps Doctrinal Publication 1, supersedes Fleet Marine Force Manual 1." Available online from the Joint Electronic Library, Defense Technical Information Center, U.S. Department of Defense.